Sally Jacobs, a member of BAGSC for many years and a former officer, is having a show of her new work at the TAG Gallery, February 27-March 22, 2008. The opening reception is Saturday, March 8, 5-8 pm. The address of TAG is 2903 Santa Monica Blvd (at Yale), in Santa Monica. 310-829-9556. She’d love to see you there. She’ll also be giving an “Artist’s Talk” on March 19 at 7pm. The normal gallery hours are Wed-Sat, 11 am – 5 pm. Questions? Email Sally. 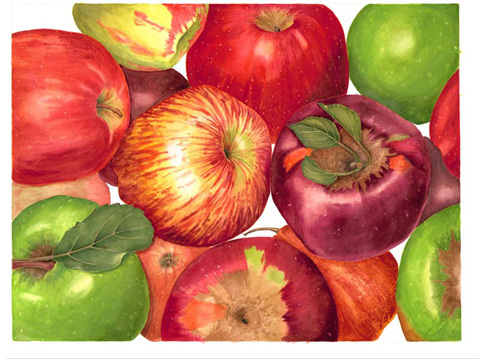 I really love the variety and mixtures of the apples. The depth you capture with the apples piled on each other really adds to the work. Wow! Bold apples and really sharp corn. Very nice, Sally. As usual.